Glass picks up an unspecified time after Split. The multi-personality Kevin Crumb, now dominated by the superhuman Beast, is once again kidnapping girls. Security guard David Dunn, who works with his son, Joseph (Spencer Treat Clark), has become Philadelphia’s Batman – a shady vigilante who wanders the streets handing out justice without due process. He’s on the search for Crumb and, when he finds him, there’s a showdown that ends with both of them being taken into custody. They are transported to a maximum-security asylum to occupy rooms alongside a third special prisoner – Elijah Price a.k.a. Mr. Glass. The three are to be treated by Dr. Ellie Staple (Sarah Paulson), a psychiatrist who specializes in “superhero delusions.” Her goal is to convince her patients that there’s a difference between comic books and reality and no one in the “real world” has superpowers. Of course, she underestimates the three men and, while she lectures, the seemingly catatonic Mr. Glass teams up with The Beast and sets up a situation that forces Dunn’s hand. Glass’ superhero elements, although developed by someone who clearly understands comic books (although perhaps not as well as Kevin Smith), don’t impress. The action sequences aren’t well choreographed and lack the verve and energy of the more established franchises. This being Shyamalan’s work, there are twists but they’re not on the Sixth Sense level. Clever red herrings aside, it’s a little disappointing that the story is so straightforward. There’s a lack of visceral satisfaction in how things wrap up (although one can make an argument that it’s intellectually effective). When I wrote my negative review of Split two years ago, one of the few things I praised about the film was McAvoy’s performance, saying that he “takes center stage with his deliciously over-the-top representation of about a dozen personalities… He goes all-out with a gusto that at times almost makes Split watchable.” If anything, McAvoy is more mesmerizing this time around, expanding the number of characters he portrays. He interacts with himself better than with his co-stars and manages the seemingly-impossible task of stealing the spotlight from the magnetic Jackson (who is unusually subdued). Bruce Willis plays Dunn as tired, worn-out, and world-weary – a facet that borrows a little John McClane and combines it with Hugh Jackman from Logan. For me, Unbreakable offered a clever twist to the then-developing superhero genre. Split was a horror film failure. Glass falls somewhere in between the two – a transparent attempt by Shyamalan to seize the moment and bring back popular characters but, lacking a compelling story, he instead substituted half-finished ideas. 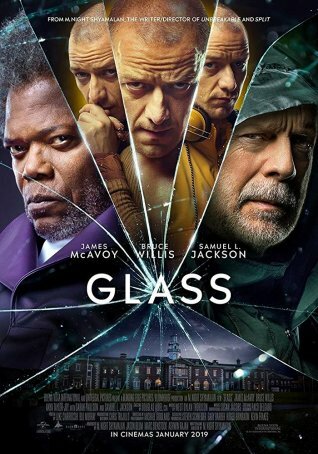 It’s watchable but underwhelming and, although there are avenues another installment could explore, Glass offers a tidy conclusion to the stories of these characters in this universe.